Tyler Roberts is challenged by Brentford's Ezri Konza. LEEDS UNITED have improved on previous seasons but they don’t have the required strength in depth that Brentford and other teams have. It’s very evident and will prevent promotion sadly. Brentford played us at our own game on Saturday and were better at it. We were rather fortunate to stay in the game. Brentford's Sergi Canos (right) challenges Leeds United's Kalvin Phillips. Gjanni Alioski is a good team player but offers little threat as an attacker. Jack Harrison is a talented young prospect but has no experience at this level and it’s glaringly obvious, to our cost. Tyler Roberts is similar to Harrison and needs more experience if he is to be a game changer. Our front six were not as good as the Brentford front six and that was obvious too. Our tactics are good but we need improved quality to sustain a realistic challenge, kids and reserves won’t do the job. It seems Marcelo Bielsa’s view is that game errors will always present themselves in some form or another. It’s a given. It’s how we focus on what we can control. Just now we are riding a storm caused by multiple injuries and a small squad. It’s very likely that we’ll strengthen in January. Players will return. In this storm we’re picking points up. We’re using the squad in a way which makes every member of it game ready. We’re still in the mix. I said over two years ago that we had seen no ambition for years. Now fierce ambition is in plain view and we are all round in the hands of professionals. I believe Bielsa – we keep improving, we deal with what’s out there and we get stronger. Don’t judge us now, see how we are at Christmas, then see where we are in May. We’ve had a fantastic start. One defeat in 12, but we need to start winning games again. WBA could open up a lead over the coming weeks with their firepower, but this division is so tight. Middlesbrough/Forest/Derby/Brentford/Sheffield United/Stoke/Aston Villa will all be up there. It’s going to be very difficult for us I suspect. It’s hard to overstate just how bad the refereeing was in the Leeds United v Brentford game. I don’t think I’ve ever seen such an inept display but that doesn’t paper over the fact that most of the men in white were well below their best. Liam Cooper has been largely dependable this season but had a shocker and Luke Ayling just didn’t seem interested. Pontus Jansson is the only one who really came out of that having played well. I know Marcelo Bielsa has always said that he likes a small squad but this one seems to be looking rather threadbare in places. Without the creativity of Pablo Hernandez and the finishing of Kemar Roofe we just didn’t look anything like threatening enough, and now both wing-backs are possibly going to be out next time. We’re hanging on in there but I really hope we’re going to look to strengthen in January. We have done well considering the injury situation. Tyler Roberts is a very good link player and when Kemar Roofe returns along with Pablo Hernandez, I can see him vying with Samuel Saiz for that number eight position in the hole. He holds the ball up well also and is an intelligent player. We will have a good second half of the season I feel. Izzy Brown is a quality player, and Patrick Bamford, Roofe, Pablo, Barry Douglas, Gaetano Berardi will come back. We’ve done well and with two quality incentivised signings in January then we will go right till the end I feel. I would like to see Tom Pearce playing in Gjanni Alioski’s position to see how he fares. 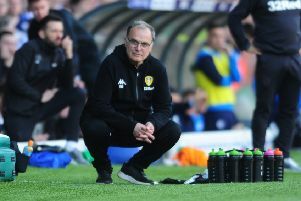 Marcelo Bielsa’s appointment has only papered over the cracks of a squad, which is clearly still in need of major strengthening. The difference between us and Wolves is very easy to explain. Wolves were prepared to spend the money required that ensured they brought quality players to the club. Victor Orta’s approach was to go out and bring back players nobody had even heard of before, who were unproven at this level and were going to be free transfers or cost next to nothing in the transfer market. That is the difference between wanting and ensuring promotion, instead of gambling on players who were not good enough in the first place.